I’ve enjoyed photography since high school, when I had the opportunity to take a photography class (how lucky was I to attend a public school that thought photography was a good use of time and resources!) For many years my camera focused on our kids, but when digital photography became popular, I left the family photos to my son. Then a few years ago my husband bought me a Canon Rebel for my birthday–and I fell in love with photography again. I occasionally post birds and bugs on Facebook, and sometimes (although not often enough) I use my photos for poetry prompts. 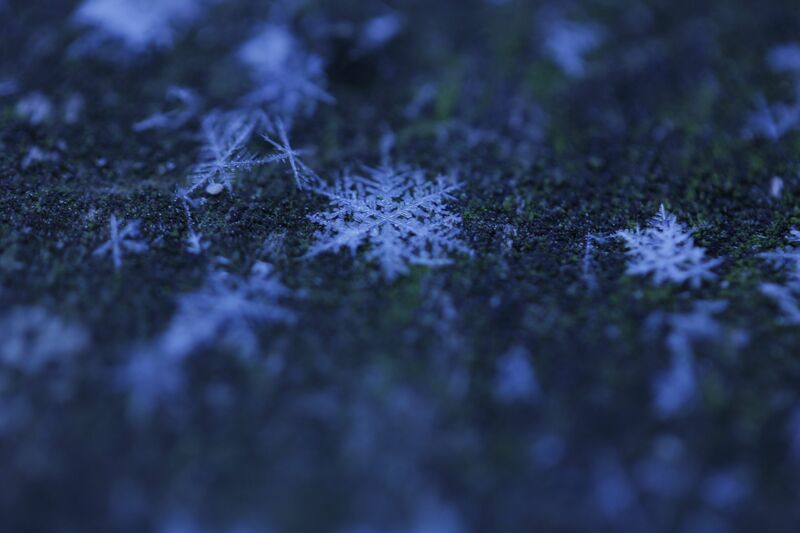 Earlier this week I tried taking photos of snowflakes for the first time. I am no Snowflake Bentley, but I managed to get a decent shot of the flakes on our picnic table in the low afternoon light. When I posted it on Facebook with the caption “Snowflakes at dusk,” Matt Forrest Essenwine commented that it would be the perfect title for a poem. I decided to take his challenge. And then I wrote: What ties all this together?? muffling the crunch of frozen ground. So there you go, Matt. Three poems for the price of one! If my snowflake photo inspires you, dear readers, please share a poem in the comments. Happy Poetry Friday. Tabatha has this week’s round-up at The Opposite of Indifference. This entry was posted in Uncategorized on January 7, 2016 by Buffy Silverman.